We all know that watches are very precise. If you use inappropriate tools, it will destroy the precision of the watch, so you need to use professional tools to repair the watch. The handle is easy to apply force and comfortable. Made of fine quality metal, has a long service life. More precise, will not damage the back cover of the watch. 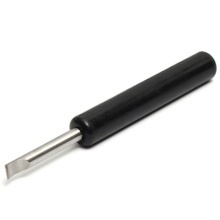 It is a must-have tool for watch repair, improving work efficiency and suitable for most watches.